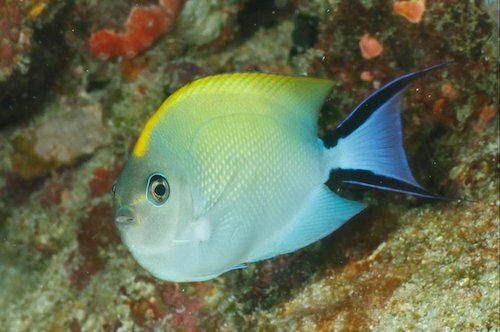 In this article we’re going to take a look at another interesting variety of saltwater angelfish — the Swallowtail Angelfish (Genicanthus semifasciatus) or Masked Swallowtail Angelfish as it’s sometimes called. 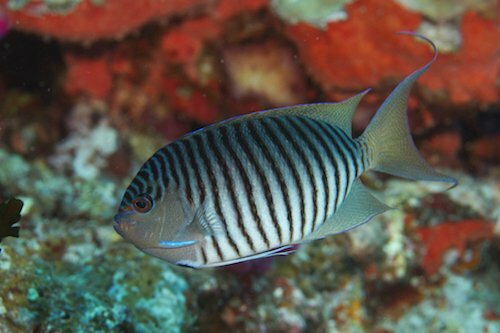 This fish hails from the waters located in the Western Pacific, Malaysia, Fiji, Japan and New Caledonia. It’s a very hardy species and is ideal for those new to the world of saltwater aquariums. 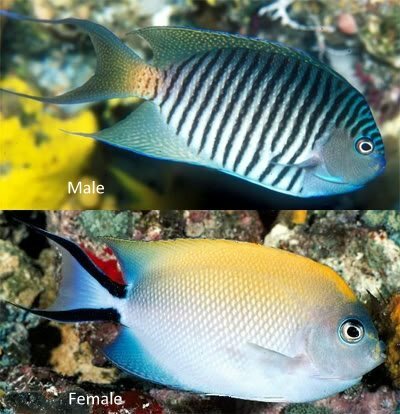 Unlike many varieties of saltwater angelfish, the Swallowtail males and females look entirely different. The male is silvery/blue with vertical black, zebra-like stripes, while the female is a shimmery yellowish/silver with no stripes. They typically swim at deeper depths than many of their counterparts making them a little tougher to catch, and therefore more expensive. It’s not unheard of to see prices of these fish go up into the hundreds of dollars for a single specimen. The average size for the Swallowtail Angelfish is about 7 inches, which means it’s suitable for smaller aquariums of around 100 gallons, but 135 gallons is better if you’re planning on keeping a male with several females. In the wild, the Swallowtail Angelfish prefers a stronger current, so keep that in mind when planning your set up. They, like most species of saltwater angelfish, like plenty of rock in which to hide and on which to graze for algae. While you need to give them plenty of places to hide, they also need a lot of room to swim as they are very active. They are also much more friendly to reefs than other varieties and won’t destroy your corals as will other angelfish. The water conditions they prefer are as follows: Temperature 72˚-78˚ Fahrenheit, pH 8.1-8.4, medium water hardness, and a specific gravity of 1.021-1.025. The Swallowtail Angelfish is relatively peaceful and should get along well with most of its tank mates, although they don’t get along well with other male swallowtails or males of the same genus. You also may be cautions about housing these fish with much smaller fish as they tend to go after them. In the wild the males often gather a harem, so you could ideally keep one male by itself or one male along with several females. In the wild these fish are found at deeper depths than other species of saltwater angelfish and it’s recommended that you use lower light levels to mimic their native lighting conditions. 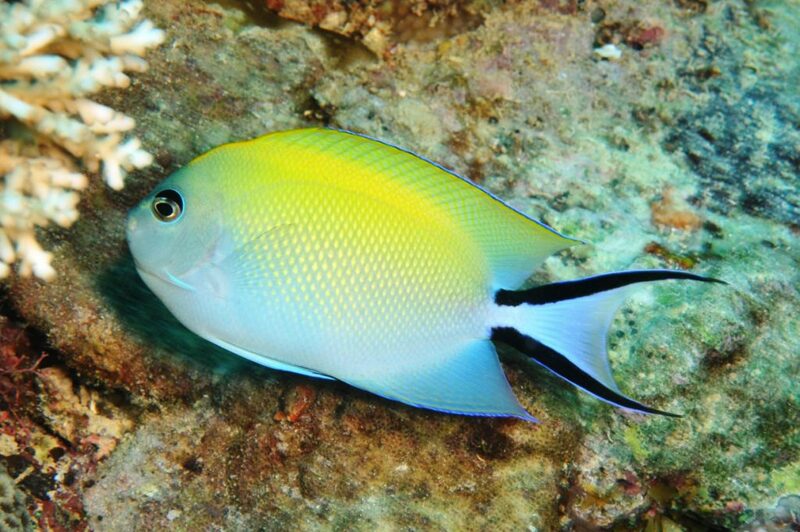 One thing to note is that the Swallowtail Angelfish tends to not do well during the shipping process. Many suffer from decompression ailments that affect their ability to maintain stability. Be wary of a specimen that appears to be standing on its head or if they have torn up fins. If you do get a healthy one, they tend to adapt to their new homes quickly. As with most varieties of saltwater angelfish, there are many diseases that can affect them if they’re not properly cared for. The most common disease is called Marine Ich (Cryptocaryon irritans) also known as Salt Water Ich or Crypt. This disease, like many others, is usually brought on by stress and manifests itself as tiny white spots that appear over the fish’s body. In addition, the fish will scratch itself against the rocks. Another common disease is called Marine Velvet (oodinium ocellatum) or simply Velvet. This parasitic infection causes the fish to develop a brownish/yellow dust-like coating all over its body. Other symptoms include clouded eyes, breathing difficulty and clamped fins. The key to preventing these and other diseases is to keep the fish’s stress to a minimum. Stress can come from a variety of factors; the most common being sudden change in water quality or housing them with inappropriate tank mates. 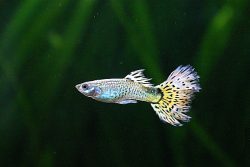 As long as you’re diligent about keeping your tank’s water quality high, feeding them a proper diet and seeing that they’re not being pestered by other fish, there’s no reason they shouldn’t remain happy and healthy. In the wild the Swallowtail Angelfish is a planktivore, which means they dine on plankton plucked from the water column, but they are — like most saltwater angelfish — omnivores. At home they will do well on a varied diet including diatom and filamentous algae, as well as meaty treats such as fresh chopped shrimp, frozen brine shrimp and mysis shrimp. You can also feed them high quality flakes or pellets that contain spirulina, which can be found at most reputable pet retailers. Breeding these fish at home is difficult. They are known to breed in large, commercial tanks, and only by experts. Some would say the Swallowtail Angelfish isn’t as attractive as other varieties of saltwater angelfish, but they do have a unique charm. They’re very friendly and relatively easy to care for, which makes them a good starter saltwater angelfish for the beginning hobbyist provided they get a healthy specimen from the start. 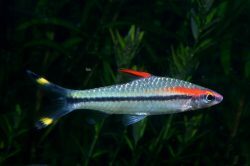 With proper care and attention, these fish will make a beautiful addition to your home tank for many years to come.